To put some context to it, Hellboy introduces its title character in a luchador match against a vampire. Sounds kitschy and quirky, like this Hellboy character not only cracks wise but lives in a narrative world that cracks wise with him. Unfortunately, the scene unfolds stagey, and the visual animation of a man changing into a vampire is clunky. From here on out, the film follows this trend, as opposed to the trend of quality wise-crackery. As Hellboy gets into scuffles with disparate foes, a pig monster attempts to revive and reconstruct the powerful witch Nimue (Milla Jovovich), who was decapitated by King Arthur in 517 AD. 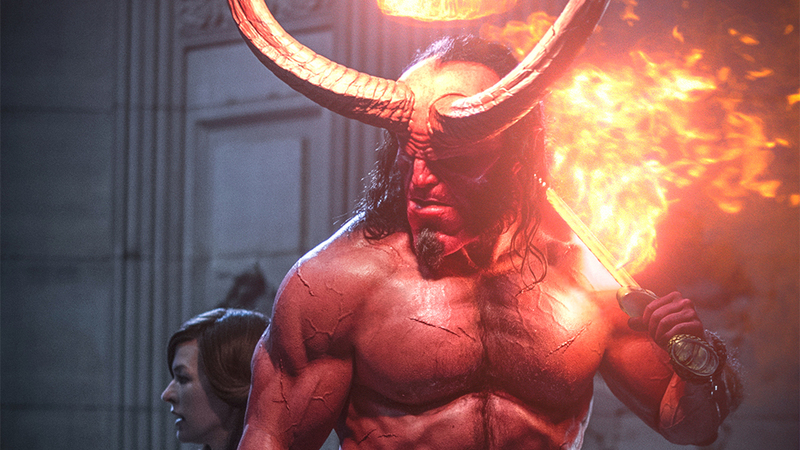 Eventually, the protagonist and antagonist have stories that cross, but for the bulk of the runtime Hellboy is just grotesque visuals, stagey green screen action, and stop-start storytelling beats. On the action choreography front, there is one scene that I believe distills the inadequacies of the film. Somewhere in the second act, Hellboy goes up against three ugly looking giants, whose skins are rendered so slippery and rubbery that they look like assets from an early seventh generation video game. Hellboy ducks and dodges as the giants lumber around, swinging at him. If you focus just on Harbour’s movements (God save him), the facade of the visuals falls apart completely. It looks like a man in red makeup jumping around from mark to mark. It never, for a moment, looks like a comic book character come to life fighting a trio of giants. The less-CG dependent action sequence are choreographed a tad better. But from a visual standpoint, most of the movie looks, frankly, unfinished. And here’s the thing, a Hellboy film in 2019 not only needs to live up to the adept visual design of other contemporary action movies (I’m no fan of Alita, but that film has some cutting edge visuals), but it also needs to live up to a film that came out in 2004. Now, I do not adore Guillermo del Toro’s Hellboy films, but they are competently plotted and have visuals that, by and large, hold up. Marshall’s Hellboy contains visuals that don’t hold up at the date of its release. Hellboy 2019, from a visual and narrative standpoint, makes Hellboy 2004 look like the Casablanca of comics adaptations. The only time when it feels like Marshall is exercising his horror director muscles and really having fun with the computer generated aspects of the film is a sequence of giant demons wreaking havoc on England. This sequence is truly horrifying, which does not mesh with any other tone that has been introduced in the film. As a result, it is purely unsettling without adding anything to the film, causing it to come off as needlessly cruel. All the same, Marshall makes this sequence the most visually compelling and creative of the film. Not only does Hellboy slink into an ugly display visually, but it also fails to bring anything compelling out of its story. The script is a continual slog to sit through when you look merely at the poor dialogue, but the structure of the story makes comprehending the potential intrigue of the film impossible. It is a prime example of and-then storytelling, in which causality is formed between narrative beats by incident without true development. Hellboy gets a mission to go to point B. And-then, at point B, a new character is introduced (merely for the one scene) to inform Hellboy on what he must do next. And-then, he travels to the point C indicated by that character. And-then, something randomly attacks him! And-then, the action is resolved, proving those attackers entirely unimportant, because Hellboy gets called back to point A, where he will be led to point D. And-then point E. And-then point F. Etcetera. Quickly, the film gets a feel of a random string of incidents, rather than a story in which we come to care about Hellboy and his comrades. The thinnest through-line is strung together involving Hellboy’s adopted father (Ian McShane), but otherwise the plot unfolds merely because the script requires Hellboy to move to the next beat. This is seen most clearly, in all of its inelegance, right before the climax of the film. Hellboy and friends are standing at the mouth of a cave, looking out onto the ocean. They talk about something, perhaps in an attempt to force some chemistry into this team, then one character gets a phone call. Uh-oh, something happened at point A. They travel to point A. Uh-oh, the climax is already starting at point X. Let’s go! In a series of scenes adding up to no more than 90 seconds of screentime, the trio jump from location to location to location and then suddenly find themselves in the middle of the climax already in progress. It’s all a mess. Even if you can find some scenes to grasp onto to fuel your enjoyment of the film, the utter lack of cohesion in the narrative, the tepid attempts at cheeky humor in the dialogue, the grotesque audio-visual landscape (did I mention the score during action scenes is a horrible sputtering hard rock techno loop? ), and the lazily conventional character development will make it difficult to see the entire product as anything worth recommending.